Racing tips: Shenanigans afoot at Pontefract? Shenanigans will not be winning out of turn if coming good in the Weatherbys General Stud Book Pipalong Stakes at Pontefract. Roger Varian’s filly was thoroughly impressive in handicaps at Goodwood and Newmarket last summer, before rounding off with a runner-up finish on the Rowley Mile. Although she has failed to add to her tally of three career wins this season, she has actually enhanced her reputation, filling the runner-up spot in Listed events at Kempton and Goodwood and placing third in the Group Three Princess Elizabeth Stakes at Epsom last month. Highly Sprung bids to complete a course and distance hat-trick in the King Richard III Handicap. Having won five races during a three-season spell with Mark Johnston, the five-year-old joined Les Eyre last October after being snapped up for 13,000 guineas. Although his first two efforts for his new connections were nothing to write home about, he looked to relish the drop to six furlongs on a fast surface when scoring here last month and proved that was no flash in the pan when following up a week ago. Gainsay can continue a fine season by landing the Bet Online Now! 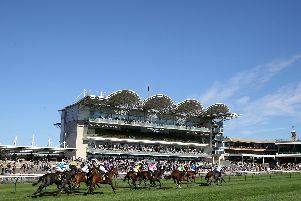 starsports.bet Fillies’ Handicap at Brighton, while Energia Flavio can claim a third win at Wolverhampton in division two of the sportingjobs.co.uk Handicap. Dan Skelton’s recent Southwell scorer Atlantic Storm rates the best bet over the jumps at Uttoxeter in the Betfred “Super League” Handicap Chase. Brighton: 5.40 Party Dancer, 6.10 Burj, 6.40 Gainsay, 7.10 Oasis Fantasy, 7.40 Sharp Operator, 8.10 Lalania, 8.40 Chizz De Biz. Roscommon: 5.50 Gigiplan Two Seven, 6.20 Amschel, 6.50 Ted Bach, 7.20 Lasoscar, 7.50 The Trigger, 8.20 Iamastartoo, 8.50 Just A Boy. Uttoxeter: 6.00 Elysian Prince, 6.30 Atlantic Storm, 7.00 Samson, 7.30 Movie Set, 8.00 Equus Flight, 8.30 Undisputed, 9.00 Mythical Legend. Pontefract: 2.00 Octave, 2.30 Danehill Desert, 3.00 SHENANIGANS (NAP), 3.30 Highly Sprung, 4.00 Herculean, 4.30 Chikoko Trail, 5.00 Quoteline Direct. Wolverhampton: 1.45 Pushkin Museum, 2.15 Simon’s Smile, 2.45 Dutch Monarch, 3.15 Energia Flavio, 3.45 Mischief Managed, 4.15 Junderstand, 4.45 Kismat, 5.15 Simple Thought.